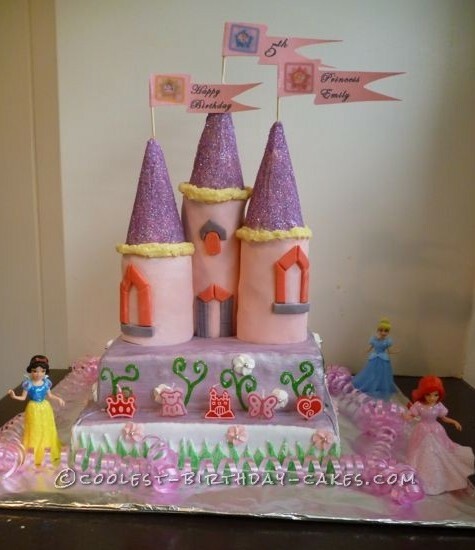 This princess castle cake was my first attempt ever at a decorated birthday cake. I am not a good cook so I was quite worried! It was reasonably simple but took a long time. I got inspiration from this site, other sites and a book and put all the ideas together. This site helped a lot because people who hadn’t done it before turned out really good cakes and it gave me hope! I made 2 square cakes, one larger than the other and stuck one on top of the other with butter cream icing then draped fondant icing over the top one and put it on the bottom one in strips, all joins were joined together with water rubbed in. 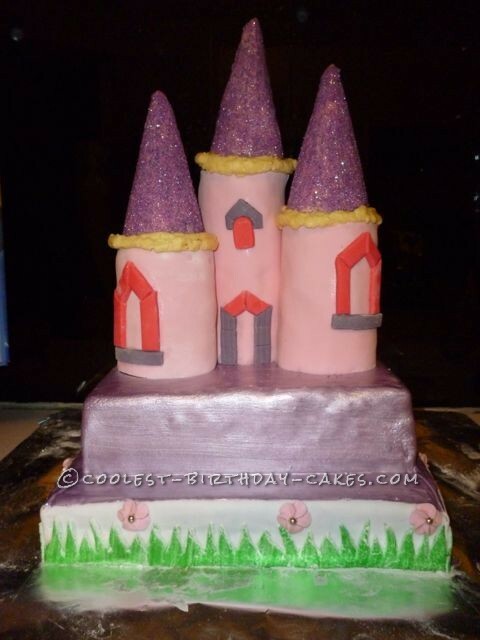 I painted purple pearl edible paint over the top cake and top of the bottom cake. The towers were made from bought unfilled chocolate log that I spread with butter cream icing and re-rolled. I then rolled them in fondant icing that I colored pink (just with red food coloring. I attached them with bamboo skewers. I then broke the ends of the waffle cones little by little to level them and covered them in butter cream icing to roll them in purple sugar mixed with pink glitter. I attached them to the towers with butter cream and piped some round the join. 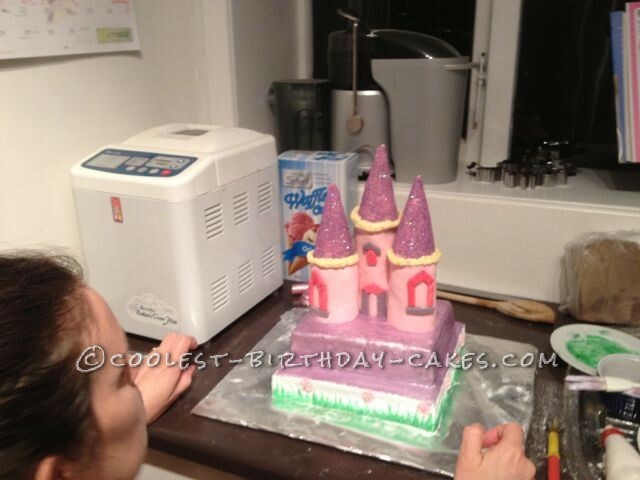 I colored some fondant a darker pink (with red) and purple and cut out the shapes for the windows and door. I painted strips of fondant with green food coloring (I don’t know why I didn’t just add green coloring into the icing) and cut out the grass shapes for all four sides. All the icing was glued on with water. I drew the vines/plants with a green glitter pen on every side and stuck the bought flowers on the plants and grass with butter cream icing. Lastly I stuck the flags on toothpicks with sticky tape and stuck them through the ends of the cones. I had printed them out on the computer and cut them to shape. I put the princess candles in the bottom cake and placed the ribbon round the outside with the dolls. It turned out really well and I surprised myself, I had so many great comments from everyone, they were really impressed! My daughter said I did really well, too, and that was the most important person to impress.